The post $50 off appeared first on Remove Tree Stumps in Sydney. If you want to encourage native bird life in your garden, hanging a birdseed bell or leaving out food scraps for them to eat is not the way to do it. You need to create a garden which is bird-friendly, and will encourage birds to not just come for a feed, but to nest and make your garden their home. In order to attract native birds, you should plant native flora. Grevilleas, Banksias and Acacias are excellent sources of nectar, insects and shelter for many native species. 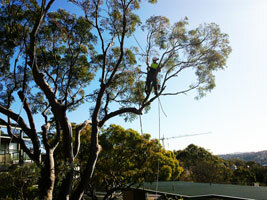 Larger species require larger trees for their habitat – Kookaburras, Currawong and Parrots all require native trees of substantial size to feel at home in your garden. Smaller species like Honeyeaters, will be encouraged to visit if you plant nectar producing bushes and trees. If you are unsure of the type of bird visiting your garden, you can search using descriptives such as size and colouring to find the name of the bird, and read about its habitat, feeding and breeding practices on the Birds in Backyards website. As well as providing native flora for bird life, a small pond, fountain or bird bath will also encourage winged visitors – especially on a hot day. If your pond has fish in it, you will want to cover the pond with chicken-wire or something similar, because many birds enjoy freshwater seafood! Bird baths should be placed in dappled shade and perched high enough for the birds to feel safe and comfortable. It should also be close to shrubs or trees so that the bird can escape if frightened. Birds drink and bathe in the same water, so the water will need to be refreshed quite frequently. A shallow pond with a fountain and various levels and depths would be perfect. Providing nest boxes is another great way to attract bird life. Natural hollows in the trunks of old trees used to provide a nesting place for kookaburras and parrots, however in the suburban landscape, old trees are removed and so this natural habitat for nesting is not so freely available. If you are serious about encouraging birds to make your garden their home, then consider a few nesting boxes carefully placed at a safe height and in the shelter of a healthy tree. The key to creating a bird friendly garden is to create structural diversity with a good mix of native plants. Plants should include a range of shrubs of varying heights, grasses and ground covers and some nice tall trees. Using mulch around garden beds encourages insects, which in turn encourages birds to visit and feed. The post Birds in the Garden appeared first on Remove Trees.